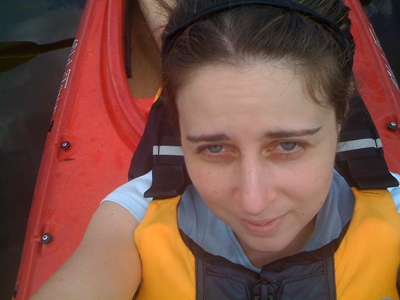 So much fun with the hubster yesterday out on the Charles River in a fire red double kayak (how perfect for the fire theme!) Man, what a workout! It was wild being out on the river, it felt like we were in another world, far from the hustle bustle. Everything but the tips of a tower were hidden by the greenery hugging the shore and our only company were birds and other kayakers. I was inspired by the reflections and ripples in the water, the bits of flowers and trees that grew up in the middle of the river, and the birds sleeping peacefully while balanced on one foot. At the end of it all, I was quite cooked by the sun and paddling, but we had a great time. And the afternoon nap helped. My attempt to snap a picture of he and I in the kayak with my iphone didn't go so well, but you can see a bit of his hairy leg in there. Hehe. I hope you've all had a beautiful summer weekend! Oh what a lovely photo! 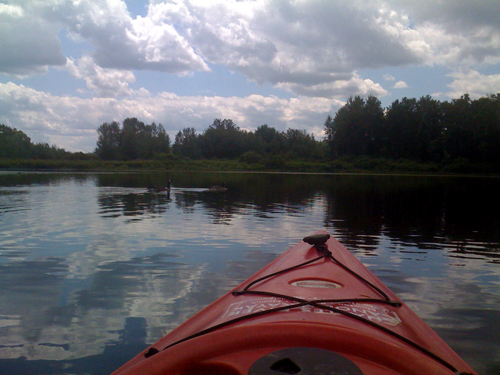 I wish I were on that kayak–it sounds so peaceful! Thanks for sharing! I love that first photo. What a lovely place. And you reminded me that the theme of the month is FIRE. I had it wrong. I linked to you yesterday and said it was LIFE. but I guess it’s August, huh. What a beautiful shot of a beautiful spot. Charles River? in Boston? Yes, lovely reflections.